The morning sun shone as the two of us crunched through the snowy forest on the Clark Range View Trail. Yosemite National Park. 35 degrees outside as we walked four miles. 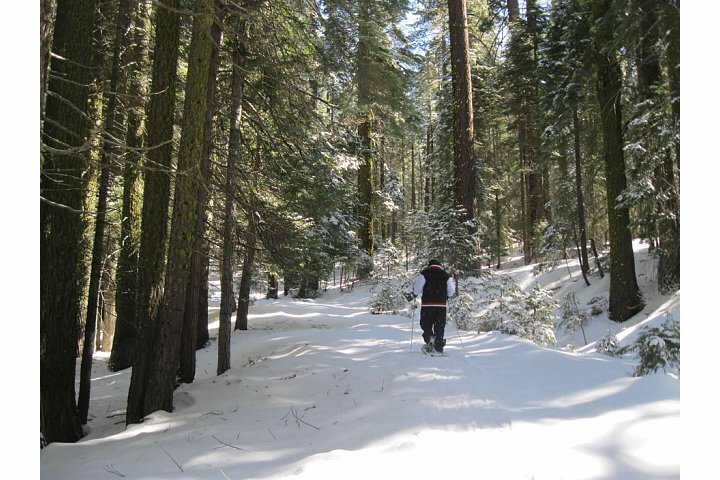 This entry was posted in Snowshoeing, Yosemite Hikes and tagged Clark Range View Trail, Snowshoeing, Yosemite National Park on February 21, 2013 by Janet. It was very peaceful there. No noise except the sound of our snowshoes and the snow melting from the trees. Wonderful photo. To me it was interesting to see Yosemite National Park in winter. We have been there twice during our holidays in the States. Looks like a lovely hike. It was a bonus that it was so mild.